Today I was able to knock yet another item off my 26 list. This item was also actually on my Holiday To-Do List (President's Day counts as a holiday, right?!) AND my NYC To-Do List - is that cheating? I had a successful ice skating experience at Citi Pond at Bryant Park this morning! A lot of items on my 26 list are "successful" blah blah blah - successful ski trip, successful sushi experience (check to both from my 25 list); successful camping trip (will probably be transferred to my 27 list) as a redemption for experiences I had when I was younger which didn't go exactly as planned. 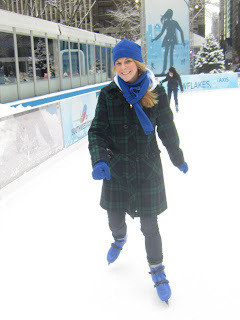 I *think* the last time I ice skated was with my Girl Scout troop way back in the early '90s. The way I remember it, I tried it, fell a few times, and quit so I didn't get hurt anymore or embarrass myself further. For some reason, getting hurt and being embarrassed doesn't matter to me anymore so I decided to sign up for a volunteer opportunity through work (also an item on the list, to volunteer more) to help out with an ice skating event in Bryant Park. Last night I was hesitant about my decision to sign up because of the forecast for those dreaded words, "wintry mix", also known as snow/rain/sleet. Luckily, it ended up just snowing - did you ever think I would say it was lucky that it snowed?! I was thinking I was going to sit out for a little and watch people first but one of my friends convinced me to get out on the ice right away. Do I still look like Tonya Harding? It was awesome! I picked it up pretty quickly and ended up staying out on the ice for about three hours - in spurts of course, since there were breaks for presentations and ice-cleaning. Here's the most amazing part. If you know me, you might fall out of your seat right now...I only fell once! It still fascinates me how New York City, with a population of 8 million, can sometimes feel just like my hometown, with a population of 12,000. Today I had this feeling because of how a completely boring Sunday that would have involved me watching four straight movies on FX magically turned into an unplanned adventure with wonderful friends. I feel like when I lived at home during the summers in college it was always easy to just call up a friend without plans and spend the whole day together. Today that happened as well. During my potential 4-movie marathon (what could have been "27 Dresses", "What Happens In Vegas", "Mr. and Mrs. Smith" and "Stepbrothers") I randomly texted Ravi who luckily agreed with "I want a burger." Ravi made his way to my place and we went over to 5 Napkin Burger, which I've been dying to try since I moved around these parts. Ravi ordered the Original 5 Napkin Burger, "10 oz. fresh ground chuck, carmelized onions, gruyere cheese, rosemary aioli, soft white roll". I initially was also going to go for this, but I changed my mind and got the Bacon - Cheddar Burger, "10 oz. fresh ground chuck, sharp cheddar, bacon, raw onion, lettuce & tomato, soft white roll". I definitely was right in switching my choice because my burger was way better (for me) than Ravi's, although he insisted that his was better. But we were both very happy with our choices. Of course, as Ravi said "I always think the burger that I'm eating at the moment is the best burger I've ever had," which I definitely agree with. Ravi and I were trying to think of something to do after lunch and came up with bowling at Port Authority. Yes, you can bowl at the bus station, that makes a lot of sense, right? We texted a few of our friends to see if anyone else was around and luckily Adam was available as well. Then on a whim, I decided to text our friend (and fellow blogger) Amanda who we both hadn't seen in months and she was totally down which pretty much made my day. Who knew after months of trying to plan things to do together and then not having it work out, all it took was a spontaneous bowling trip? Amanda and Adam met us at Frames, the bowling alley, shortly after lunch. The alley had "league play" until 5:30 so we made our own fun and played in the arcade and then sat at the bar until we could get our own lane. We paid for an hour of bowling and picked out our (hideous) shoes and got rolling - see what I did there?! For some reason, I was either rolling strikes or gutterballs, never anything in the middle. But we had a great time and any bowling alley where I can dance just as much as I was dancing the previous night is okay with me. Also, it's pretty cool that Justin Bieber's music video, "Baby", was playing, as you all know it takes place in a bowling alley. After bowling, we walked on over to Amanda's family's restaurant, Zigolini's Pizza Bar (9th and 46th), which although I hadn't been before tonight, I mentioned in my pizza post this fall. The best way to experience a friend's restaurant is definitely by going with said friend. We dined on a fabulous meal of sangria, Peronis, bruschetta, arugula salad, margherita pizza, pesto pasta, rigatoni with sausage, and my favorite part, because my sweet tooth is the size of Texas, the Pizzetta da Dolce Vita aka S'MORES PIZZA. Can't wait to hang out with this crew again soon. I will forgive you all, for blowing my mind today. "Memphis" won the 2010 Tony Award for Best Musical and it is easy to see why. It was amazing. The story takes place in Memphis (shocker) in the 1950s, when DJs on "white radio stations" started to play "black music." The songs are awesome and the cast was incredibly talented, especially the male lead, "Huey" (Chad Kimball) and the female lead, "Felicia" (Montego Glover), both of whom were nominated for Tonys for their respective parts. We ended up seeing Montego walking out of the theater so we bombarded her. After the play, Chris, Kater, and I walked across the alley to Junior's because Chris wanted a piece of cheesecake. Kater and I hadn't heard of this "New York Tradition", but who are we to deny ourselves cheesecake? I ordered a peanut butter cup cupcake and a ridiculously large slice of devil food cheesecake (four days' worth) and told the cashier that I did not need a bag. He told me that it was easier *with* a bag and I said that I really didn't need one since I was just walking a little further. He insisted again that it was easier to just give me the bag and I gave up on trying to save the world and accepted my treats anyway. The funny part is that when I got home, I saw the same bag on the living room floor that indicated my roommate had also gotten a Junior's treat earlier that day. I thought it was probably a sign of some sort that I hadn't heard of Junior's before that day and my roommate ended up getting it the same day. A sign of what, I'm not sure.